We're running more of our popular screening masterclass events over the coming weeks and months. The masterclass are particularly aimed at you if you work in public health or are responsible for commissioning national screening programmes for local populations. If you are a screening lead within an NHS provider trust, you may also find the day-long event valuable for your role. Public health screening expert Dr Angela Raffle and myself (national lead for stakeholder information and professional education and training) run these interactive events using a mixture of teaching methods, including case studies and practical exercises. We also slot questions and answers and tips on sharing good practice into the day as appropriate. And PHE Screening Director Dr Anne Mackie often drops in for part of the day to answer queries. The screening masterclass was a great introduction to all of the screening programmes and gave me a good understanding of what my team was working on, and how my work would fit in with other programmes. It was a really good opportunity to meet colleagues from other screening and immunisation teams and share knowledge and information. 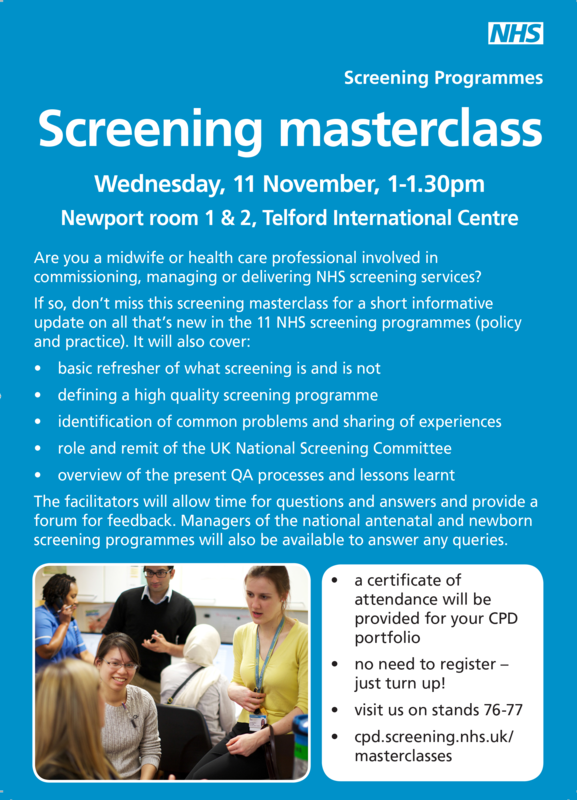 I would certainly recommend others to attend the screening masterclass, particularly as part of an induction. The masterclass was very informative and gave a broad introduction to all programmes. It was useful to learn about programmes that I don’t work on and meet other colleagues. We're holding a special one-off screening masterclass will be held at the Royal College of Midwives conference at Telford International Centre next Wednesday (11 November). The managers of the six national antenatal and newborn screening programmes will be on hand to answer any queries from participants. Two masterclasses have so far been scheduled for 2016 – on Wednesday 2 March and Wednesday 29 June. Places for each masterclass are limited and allotted on a first come, first served basis. The UK National Screening Committee charges a fee of £48 to cover the cost of the venue and catering. To book your place, please email phe.screeningmasterclass@nhs.net.